Honor 20 Lite is an upcoming smartphone by Honor. The phone is rumoured to come with a 6.21-inch touchscreen display with a resolution of 1080x2340 pixels at a pixel density of 415 pixels per inch (ppi). 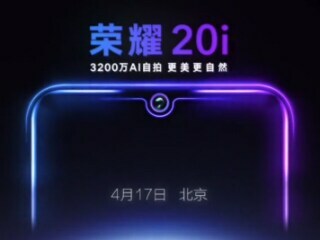 Honor 20 Lite is expected to be powered by a 2.2GHz octa-core HiSilicon Kirin 710 processor. The Honor 20 Lite is rumoured to run Android 9.0 Pie and is expected to be powered by a 3,400mAh battery. As far as the cameras are concerned, the Honor 20 Lite is rumoured to pack a 24-megapixel primary camera with an f/1.8 aperture; a second 8-megapixel camera and a third 2-megapixel camera. It is expected to sport a 32-megapixel camera on the front for selfies, with an f/2.0 aperture. The Honor 20 Lite runs EMUI based on Android 9.0 Pie. The Honor 20 Lite tipped to be a dual-SIM (GSM and GSM) smartphone that will accept Nano-SIM and Nano-SIM cards. Connectivity options on the Honor 20 Lite are said to include Wi-Fi 802.11 a/b/g/n/ac, GPS, Bluetooth v4.20, Micro-USB, 3G, and 4G (with support for Band 40 used by some LTE networks in India). Sensors on the phone are rumoured to include accelerometer, ambient light sensor, and proximity sensor. The Honor 20 Lite supports face unlock. It is said to launch in Black and Aurora colours.